The 9X18 mm Makarov is a Russian designed round, created in 1946 to be used in the Makarov PM pistol, as a replacement for the 7.62x25 cartridge and the Nagant M1895 revolver. 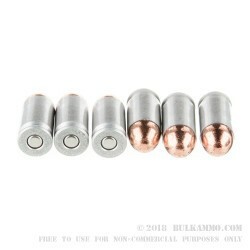 These rounds are equipped with a 95-grain full metal jacket projectile, in noncorrosive, Berdan primed aluminum cases and are not reloadable. 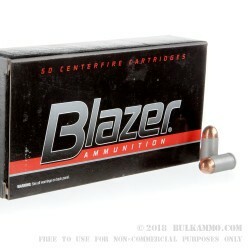 These Blazer cartridges use Speer bullets and CCI primers and is a quality round for practice at the range or plinking. Made with aircraft grade aluminum, these rounds are a more economical alternative to standard brass practice ammunition and are made in a wide variety of calibers. 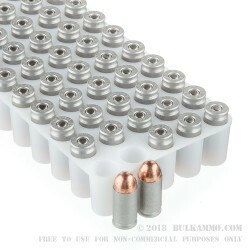 This allows you to shoot more often for less, while still using reliable and accurate ammunition! 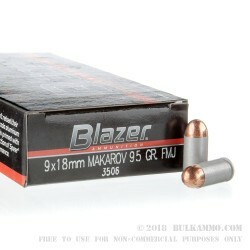 Each box contains twenty, 50 round boxes of 9x18 Makarov 95-grain FMJ from Blazer. Blazer, part of the Vista Outdoors Group is a manufacturer of high quality practice ammunition and is a favorite among shooters everywhere.